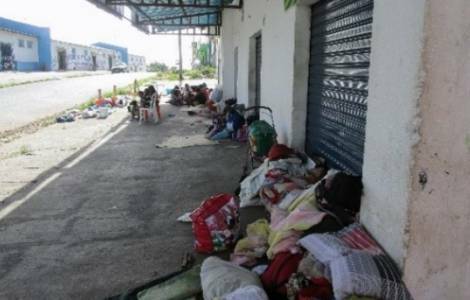 Boa Vista (Agenzia Fides) - "The racist attacks against Venezuelan migrants in Roraima, Brazil, require special attention on behalf of institutions and international community. Every border of the world, in fact, is turning into a delicate place where, instead of confrontation and reception, inter-ethnic hatred prevails". This was stated in a note sent to Agenzia Fides by Sister Neusa de Fatima Mariano, Superior General of the Scalabrinian Missionary Sisters, who since the foundation have been dealing with the reception of migrants and are also present in Roraima. According to information gathered by Fides, in past days there have been at least three arson attacks, confirmed by the police, against Venezuelan immigrants in Boa Vista, capital of the State of Roraima, near the border with Venezuela, in the same neighborhood where there are a number of Venezuelans. Besides material damage, some people were injured during the fires due to burns. The first occurred on January 31, against a car wash service. There was only material damage. The second on February 5, documented by a video of the security system: a man threw a Molotov cocktail which set fire to a terrace where 31 Venezuelan immigrants were sleeping, a girl suffered second-degree burns. In the third episode, on February 8th, a Molotov cocktail was thrown at a house in which thirteen Venezuelans belonging to the same family were sleeping, including seven children. The attack caused severe burns in different parts of the body to a 23-year-old man and his 3-year-old daughter. The authorities arrested a person suspected of all three criminal acts. At least 40,000 Venezuelans have recently arrived in Boa Vista, most of them living in precarious conditions or on the streets. AFRICA/SOUTH AFRICA - The Archbishop of Johannesburg: "Xenophobic violence is a violation of the commandment of love"